Feversham Arms & Verbena Spa – Review. Beauty Editor Julia Paddon tests out a spa and hotel in Helmsley, N.Yorkshire. Is it as elegant as the location? Location is everything. Standing firmly between the North York Moors National Park and the Howardian Hills, Helmsley is a place that I’ve visited often. Although, on first impression, you might not quite be sure why. On arriving it appears a small, typically picturesque market town with a nice square, a few shops and a couple of lovely-looking pubs. You know the sort, where you can while away an enjoyable hour, as long as the sun makes an appearance, eat some cake and watch people go by. But appearances can be deceptive. Once you’re out of the car and exploring you begin to realise there’s plenty more going on than you might have first thought. A stroll through the town reveals interesting little shops disappearing into narrow back streets, plenty of independent boutiques interspersing with well-run charity shops, tempting you with the possibility of something to take to the Antiques Roadshow in a few years. Further still there’s the fascinating Helmsley Castle, Duncombe Park Estate and the truly stunning National Centre for Birds of Prey. It certainly lives up to its worth-a-visit reputation. With that in mind, it’s no wonder that it’s home to some seriously glam food and lodgings. Which brings me to my most recent visit to The Feversham Arms Hotel. Tucked just around the corner from the square, my guest and I check in early, drop off our bags and, with the sun being out, immediately go for a stroll around. We have booked the Girly Gathering package in the Verbena Spa and so, after some very satisfying and successful shopping we settle down on the terrace for lunch outside. Verbena Spa is relaxed and friendly. The girls working there have excellent, and I mean excellent lipstick (Kylie Jenner – well worth the U.S. import tax). The female changing room is small but perfectly formed, although I think a larger group might struggle to all change at once. Lunch is enjoyable and our treatments, we absolutely agree, stand out. My friend and I decide to have the same treatments – ‘great minds etc’ – an exfoliation followed by a massage and, quite frankly, we could have walked straight back in the next day to repeat them. Aside from the showers in the SPA needing a little DIY attention, the Spa is fabulous. Our poolside suite is comfortable and well decorated and lacks only fresh milk for the tea tray. I’m sorry, but it’s a bug bear of mine… I’d gladly have strong words with the inventor of the miniature, always messy, miserly-portioned, plastic foil lid containers that dispense UHT milk in teardrop-sized portions. Did I mention how small they are? These have no place in any luxury hotel. NB: We did call reception and ask for fresh milk but were brought another four UHT portions. Being British, and almost ready for dinner, we don’t ask again. But I’m sure if we had explained Reception would have gladly supplied us with some fresh milk. Heading down for dinner the Maitre d’ is genuinely welcoming and the butter bean nibbles a refreshing change to olives as we sip our aperitif. The restaurant is quite busy. There’s the nice hum of conversation and the odd burst of raucous laughter from the private dining where an event that we decide we’d quite liked to join is going on. Finding it tricky to decide, we eventually opt for the tasting menu which, observing other tables, appears to be popular. We pretty much talk non-stop (a definite theme of my friendships and reviews) and the food and service is nicely timed so as not to interrupt our conversation. Courses are delicately balanced, with our personal stand-out highlights being the first – a terrine that is absolutely delicious – and the last, a chocolate hazelnut combination that is dessert perfection. A good night’s sleep ensues, followed by a slow browse past the hotel’s discerning artwork and a comfortingly familiar breakfast. All our dietary foibles are catered for (no bread for me, no tomato or potato for her, please) and the coffee is good. The harsh light of day suggests the dining room might benefit from a spruce up, as does a trip to the toilet in reception, revealing a tap that doesn’t work. But overall our stay at the Feversham Arms Hotel was really very enjoyable. 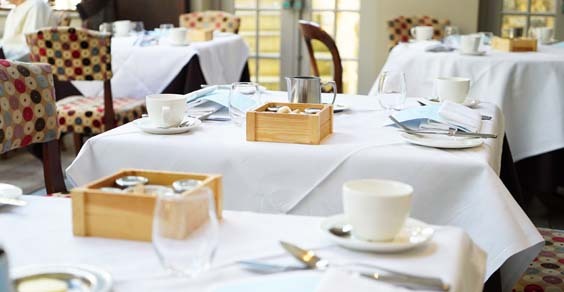 The hotel is perfectly positioned in Helmsley for a short or longer stay. 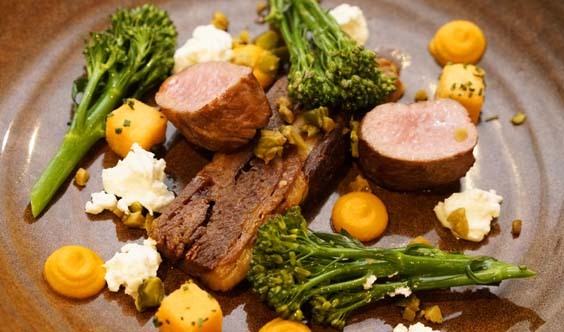 The food and service is luxurious, the treatments at the Verbena Spa very luxurious and the hotel… well, with just a tiny bit of TLC and fine tuning of the decor, could make a sumptuously luxurious triple header. Feversham Arms Hotel & Verbena Spa, located in the market town of Helmsley North Yorkshire, is an award winning hotel and spa hidden away so you can relax, unwind and indulge. 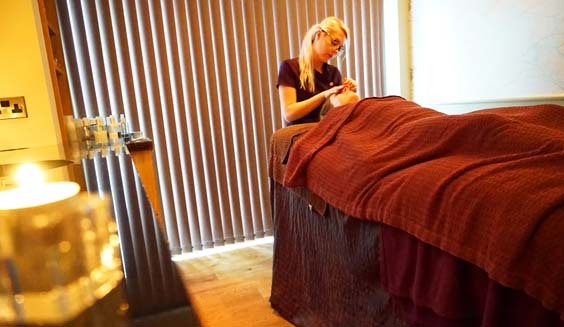 The Verbena spa is located within the hotel and houses six single treatment rooms and one couples room, in which guests can experience a tandem therapy. Treatments are provided by Temple Spa, a uniquely British brand inspired by Mediterranean healthy diet and lifestyle. The spa has an extensive Heat Experience including an aromatherapy room, salt inhalation chamber, saunarium, monsoon shower and foot spas. In addition you can relax in their outdoor heated swimming pool and Jacuzzi. The hotel comprises of 33 individually designed bedrooms and suites, each with it’s own unique decor, style and character. All rooms are equipped with Smart TVs, internet access and their bathrooms are furnished with luxurious Temple Spa toiletries. 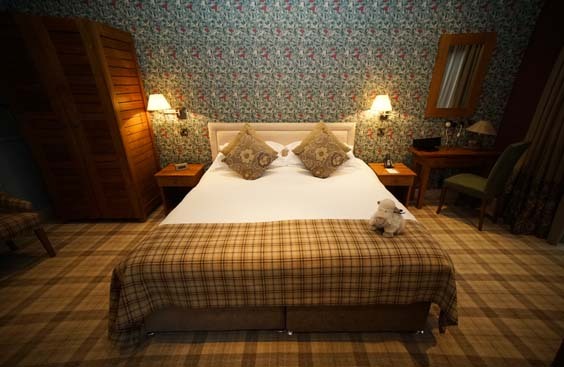 Prices start from £220 per room included Bed and Breakfast.